In a community that is heavily impacted by poverty, such as Chester, Pennsylvania, the cost of care can be a burden to accessing eye care. With only one eye doctor’s office and 35,000 residents, the oldest city in Pennsylvania needed help. 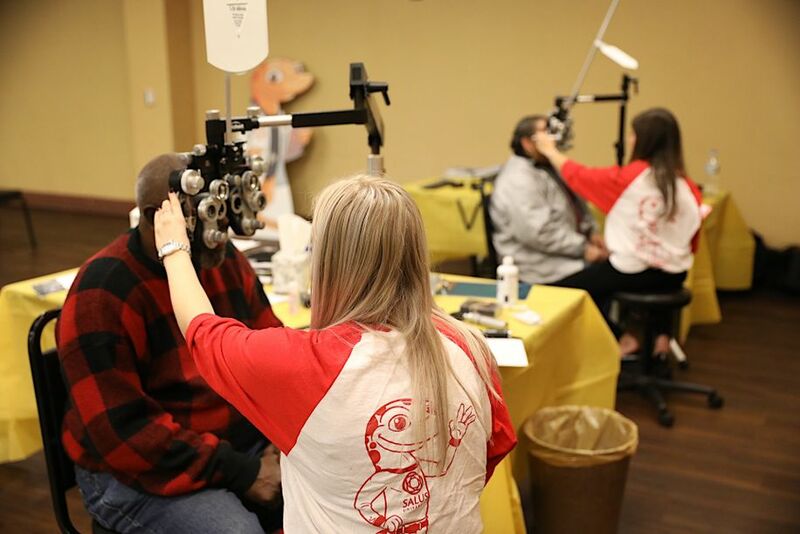 To help close that gap in access to care, on March 24-25 Salus University eye doctors, with assistance from VSP Global and the City of Chester, offered an eye care clinic for local residents. Oleszewski is the vice president for Institutional Advancement and Community Relations at Salus University. Pennsylvania College of Optometry at Salus University students—along with faculty and recent graduates—volunteered their time and expertise to provide no-cost comprehensive eye exams at the two-day event in Chester, giving them valuable insight into the communities they can serve now, and may serve in the future as doctors. “It’s a very rewarding experience,” said Courtney Goode, a fourth-year optometry student graduating from Salus in May. “Everyone is really appreciative. A lot of these patients unfortunately have been unable to afford glasses in the past, so it’s nice to have a program like this where they have access to that.” Goode chose optometry because her grandmother has a very rare eye disease and it inspired her to help those in similar need. The event in Chester provided another opportunity to serve a community she holds dear. Fourth-year optometry student Manpreet Ghuman, who also graduates in May, enjoyed the experience of her first outreach event. Ghuman has a family history of glaucoma. When her grandfather—who couldn’t speak English—visited doctors, Ghuman’s father did his best to translate, but didn’t always understand doctors’ explanations. Ghuman stepped in to help, and found a unique inspiration to pursue optometry. “(My father) didn’t understand why (doctors) were doing some things, so he’d come up and kind of tell me what happened, and then I’d go online and search it,” Ghuman said. “So it kind of piqued my interest in the whole field. Nearly 165 people received access to eye exams and glasses at the event. “The services that we provide not only are wonderful educational experiences for our students, but they bring a wonderful product and a real need to kids who otherwise in most cases would not get quality eye care and eyeglasses,” Oleszewski said. “We are a big believer that without good vision, how can a child succeed academically? So we think it’s really important that we get the diagnoses and treatment plans for these kids as early as we can. Since 2010, VSP® network doctors have provided no-cost eye exams and glasses to more than 7,500 Chester residents in need through a partnership with VSP Global’s Eyes of Hope® program.